This being Halloween, I took that as a good excuse to read an issue of TEXAS RANGERS I've been meaning to read, since the Jim Hatfield novel in it features a monster. As always with pulps that I own, the scan is from the actual copy I clutched in my grubby little fingers. The Hatfield novel, "Canyon of the Lost", is one of the shorter entries in the series, probably between 25,000 and 30,000 words. The author (more on that later) packs a lot into it, however. Jim Hatfield, the famous Lone Wolf, is sent to the West Texas border town of Gallejo to meet up with another Ranger and investigate reports of a gang smuggling opium into the country from Mexico. When Hatfield gets there, however, the other Ranger is dead, having been murdered by some sort of monster that lurks in the sinisterly named Lost Canyon. A famous photographer has also gone missing, his beautiful blond daughter shows up to look for him, and a gang of outlaws led by a masked mastermind known as The Black Buzzard is also running amok. Needless to say, Hatfield has plenty of hard ridin' and fast shootin' to do before he sorts everything out, solves the mysteries, and delivers hot lead justice to the bad guys. Whoever the real author is, "Canyon of the Lost" is an odd yarn, and not just because it has a monster in it. For the most part, it's not very well written, with some awkward prose and a plot that flounders around all over the place. As for the monster, except for a few scenes the author really wastes the whole set-up. However, the story does have a goofy charm about it and some nice action scenes. It's nowhere near top-rank Hatfield, but I liked it better than the stories by Roe Richmond or Clark Grey. Moving on to the other stories, they're by authors who aren't that well-known, with a couple of exceptions, but they seem to be real people, not house-names. First up is "The Foot-Loose Kid" by Philip Morgan, which isn't really a very good title for this tale of cattlemen vs. nesters and a ranch hand who finds himself torn between the two sides. It's a well written story, though, with enough "woman interest" it easily could have appeared in RANCH ROMANCES. "Man Afraid" by Robert S. Aldrich is about a deputy who has to take on three outlaws even though the whole town thinks he's a coward. This is another good story, with a really nice final line. 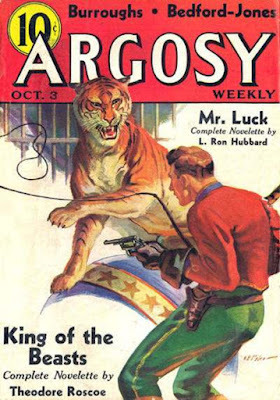 While never a big name or enormously prolific, Kenneth L. Sinclair had quite a respectable career in the pulps, turning out scores of Westerns, detective and G-man stories, and aviation yarns from the early Thirties to the mid-Fifties. His novelette in this issue, "Killer Beware", is a Western mystery with an unusual protagonist, Matt Dorban, who hauls hay for the ranchers in the area. 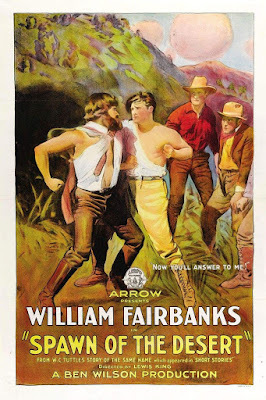 Dorban's partner is framed for killing a supposed rival for the affection of the local sheriff's beautiful young widow. There's enough lust, greed, and crime in this one that it would have made a good Gold Medal novel. I really enjoyed it. "By Gun and Fang", a short-short by Pete Curtis, is about a deadly encounter between an outlaw, a lawman, and a panther. A bleak and effective story. J.L. Bouma is probably the best-known author in this issue. 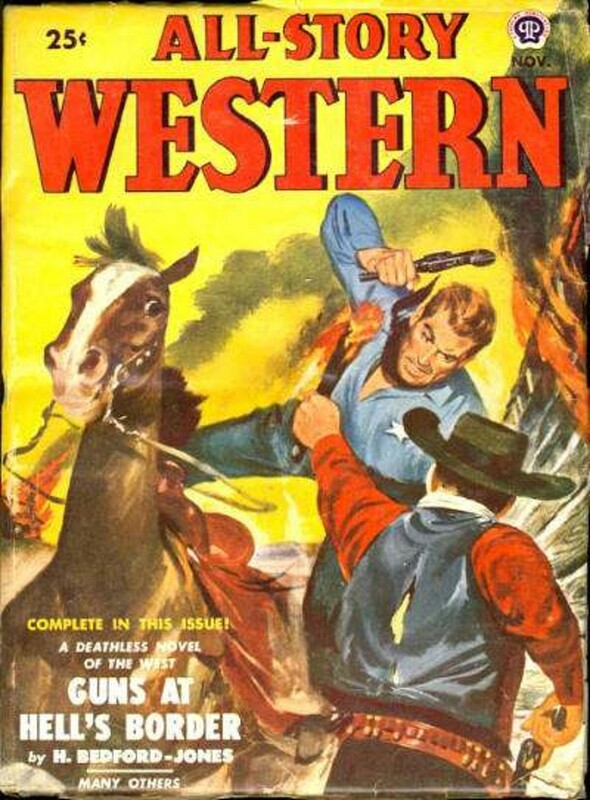 He was a prolific contributor to the Western pulps from the mid-Forties throughout the Fifties and published more than a dozen paperback Western novels. He's also supposed to have written some of the Coxeman novels under the Troy Conway house-name. I've read a few of his Western novels and found them to be competently written hardboiled yarns. The same description applies to "Lone-Hand Posse", his novelette in this issue. It's a vengeance story about a man pursuing the three outlaws who murdered his wife, and as you might expect, it's pretty dark. But it's well written and has a halfway decent twist at the end, and I liked this one as well. James D. Lee's "Within the Barridade" is about a wagon train under attack by Apaches, and for the most part, it's a suspenseful tale that's marred somewhat by the author apparently confusing Apaches with Comanches or some other Plains Indian tribe. This is the only story by Lee listed in the Fictionmags Index. It's good enough that he should have been able to sell others and may well have since the FMI isn't complete. "Lawman's Widow" is by Ferris Melvin Weddle, an author unknown to me. It's about a lynch mob, the lawman's widow of the title, and her reaction to the mob. Not a bad story, but there's not much to it. 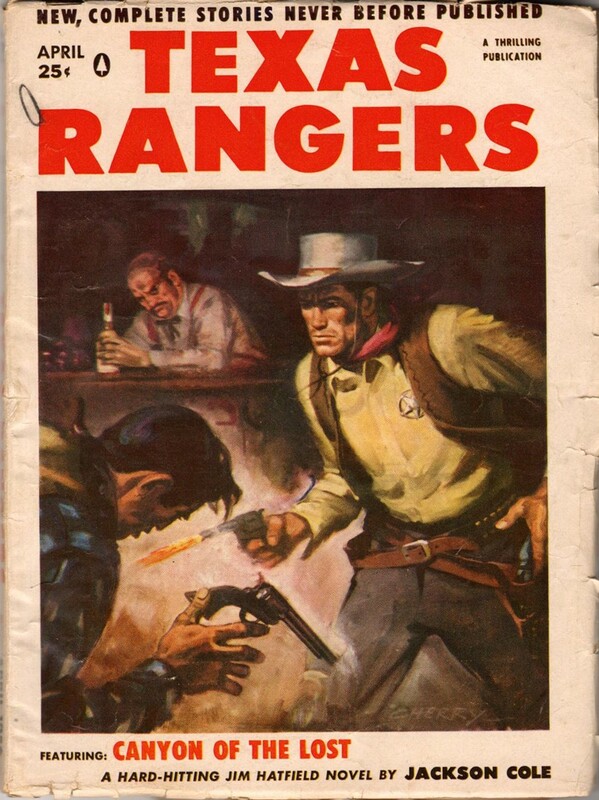 All in all, this is an unusual issue of TEXAS RANGERS because the Jim Hatfield novel is actually one of the weaker stories in it. Not really bad, just not up to the level I've come to expect from that series. The novelettes by Bouma and Sinclair are the best stories. I'm glad I read this one, but it's not in the top rank of TEXAS RANGERS issues. I've been posting about monster movies this month, partly because October means Halloween and partly because it just worked out that way. But I usually try to read a horror novel for the Forgotten Books post closest to Halloween, so this year we've got one inspired by a classic. 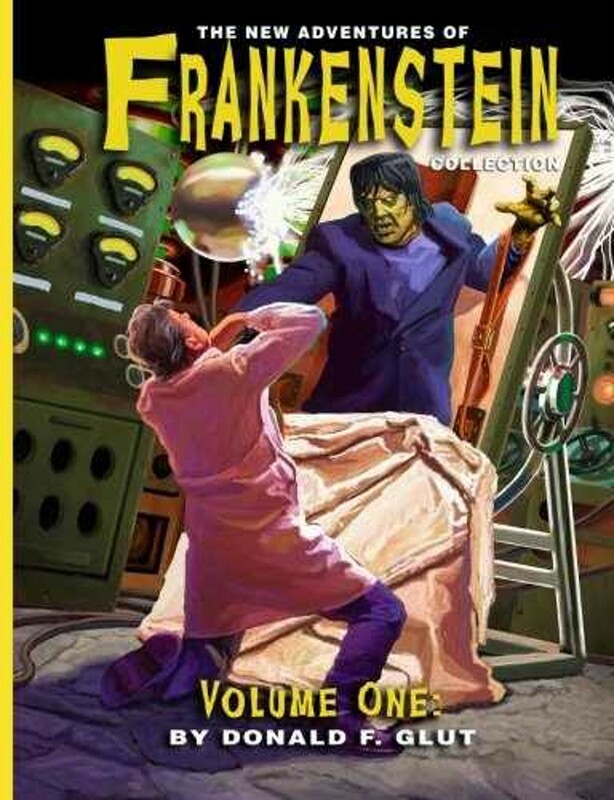 It's FRANKENSTEIN LIVES AGAIN!, the first book in a twelve-book series by Donald F. Glut that are sequels to Mary Shelley's original novel, although the movies seem to have influenced the series as well. 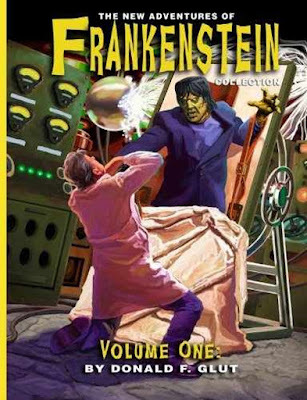 In FRANKENSTEIN LIVES AGAIN!, the protagonist is Dr. Burt Winslow, a wealthy young American scientist who's obsessed with Shelley's novel and the theory that it was based on actual events. Using the money he's inherited, Winslow sets out to discover the truth. At the end of Shelley's novel, the Monster created by Victor Frankenstein disappears into the frozen north, supposedly planning to commit suicide. When Winslow finds out that a remote tribe of Eskimos are rumored to be worshipping a giant figure frozen in a block of ice, an Ice God, so to speak, he believes that might be Frankenstein's immortal creation, so he heads into the Arctic on a dangerous expedition. Well, it shouldn't be any huge spoiler to reveal that the so-called Ice God really is the Frankenstein Monster, and of course Winslow is going to take it back to the German village of Ingolstadt, where he's already bought the legendary Castle Frankenstein and installed his beautiful blond lab assistant/lover to get things ready. And if they didn't thaw out the Monster and bring it back to life to create all sorts of havoc, we wouldn't have a book, would we? Before things are over, a crazed professor with psychic powers and his brutish assistant also figure into the plot, which features torch-wielding villagers, thunderstorms, and a considerable amount of carnage. This book is an odd mix: part comic book, part men's adventure novel, part classic horror. What makes it work is that Glut plays things absolutely straight and spins his yarn with such enthusiasm that the reader can't help but be carried along with it. I enjoyed the first half of the book, where Winslow is searching in the Arctic for the Monster and battling Eskimos, more than the second half set in Germany, simply because it's an unusual setting for a story like this, but the whole thing is entertaining and worth reading if you're a semi-grown-up monster kid like me. Glut wrote the twelve novels in this series in the late Sixties and early Seventies, before any of them were published, and you can tell it from the lack of computers, cell phones, etc. I'm glad he didn't update them. That sense of the time period adds to the charm of this book. Over the years they were published haphazardly. I don't think there was ever a uniform edition until recently, when they were published in two large omnibus volumes that are still available. This is some pretty good Halloween reading, or any other time as well if you're a Frankenstein fan. This is another movie I never saw until now, despite being a Bob Hope fan for about as far back as I can remember. I grew up watching the Road pictures on TV, and while Hope and Bing Crosby weren't my favorite comedy team from that era (I liked them better than Martin and Lewis, but not as much as Abbott and Costello), I thought the movies were really good. The drive-in just up the road from us always showed Hope's movies during the Sixties, and I saw most of his TV specials (especially the ones about the USO trips) and of course every year he hosted the Oscars. 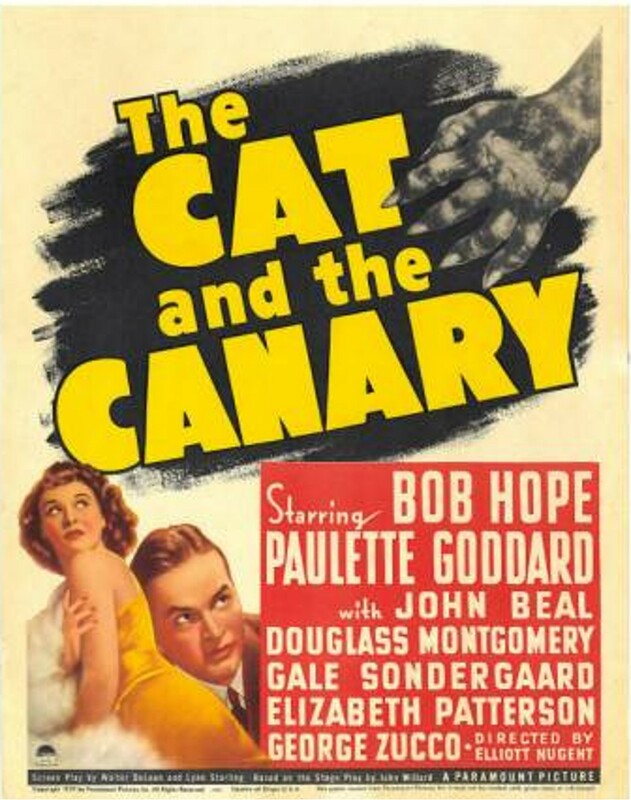 But THE CAT AND THE CANARY, which was his first real starring role in a movie, I missed that one. It's a mystery/horror/comedy, a variation on the old plot that has a bunch of heirs showing up at a spooky old house for the reading of a will that each of them hopes will make them rich. Naturally, one of the characters disappears and then turns up dead. The lights always go out just at inopportune moments. There are secret passages in the walls, bookshelves that open, eyes cut out in a portrait so the villains can spy through them, a killer in a rubber mask, and every other cliché you can think of from this type of movie. And of course none of that matters because it's still pretty entertaining. The script isn't as funny as it should have been, in my opinion, but Hope's cowardly, wise-cracking screen persona is always good for a few laughs, although he seems a little subdued here, as if he hasn't quite nailed down the character yet. Paulette Goddard is lovely, and the cast also includes Gale Sondergaard, looking as sultry and sinister as ever, and George Zucco as a lawyer named Crosby. (There are no jokes about the name. I'm convinced there would have been if this movie had been made later.) The movie is set in the Louisiana swamps, and when we first see the old mansion sitting among moss-dripping trees, it's a genuinely creepy moment. I immediately thought of Robert E. Howard's "Pigeons From Hell". THE CAT AND THE CANARY has just enough misfires that I don't think it's a great film, but it is a good one and is worth watching, especially if you're a fan of Bob Hope. Just don't expect the inspired lunacy of the Road pictures. So, this issue of ARGOSY only has stories by Edgar Rice Burroughs, Robert E. Howard ("A Gent from the Pecos", one of the Pike Bearfield stories), H. Bedford-Jones, L. Ron Hubbard, Theodore Roscoe, Anthony M. Rud, and Lawrence G. Blochman. That's all. Just another week at the newsstand in 1936. I wish it didn't have some hunks chewed out of it, but you can still tell that's a nice cover by A. Leslie Ross on this issue of WILD WEST WEEKLY. I'll bet the Tommy Rockford story by Walker Tompkins is pretty good, too, since all of them I've read have been. There are also stories by Lee Bond (twice, one under his own name and one under the house-name Andrew A. Griffin), Chuck Martin, J. Allan Dunn, and Allan R. Bosworth writing under the Dean McKinley house-name. Looks to me like a fine issue all around. 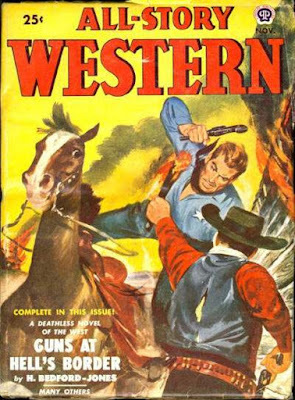 I've written before on here about how much I've enjoyed the Westerns by Australian author Leonard F. Meares, who wrote more than 800 novels under a variety of pseudonyms, the most famous being Marshall Grover. I started reading his work when I was a kid, in the Bantam editions published under the name Marshall McCoy, never dreaming at the time that years later I'd become friends with the author by correspondence. 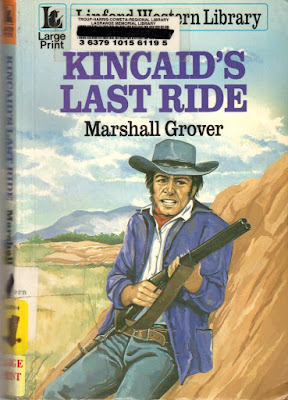 I don't read as many of his books as I used to, but I recently picked up some used large print ex-library copies of a few of them, and KINCAID'S LAST RIDE is the first one of this batch I've read. It's a very entertaining yarn, as always. Larry Valentine and Stretch Emerson, the two drifters from Texas who were Meares' most popular characters, find themselves helping out an old-timer who was just released from prison and is on his way back to his old hometown. The old-timer has a gang of killers after him because it's rumored that his cellmate told him the location of a lost gold mine that's supposed to be fabulously valuable. In a nice plot twist (Meares always packed quite a bit of plot into these short books), a beautiful young actress and her husband become involved in the affair, too, and before it's all settled there are plenty of fisticuffs and gunplay. The Larry and Stretch books, and Meares' other novels, as well, were never ground-breaking, but they're amazingly consistent in their entertainment value. I've read close to a hundred of them over the years and didn't care for maybe two of them. 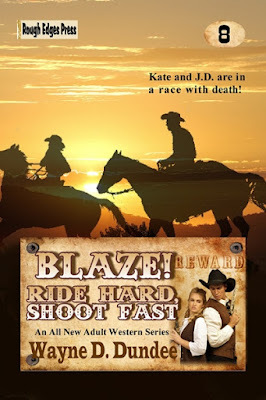 KINCAID'S LAST RIDE is fast-paced,well written, and a lot of fun. The scan is of the copy I read, complete with library stickers. 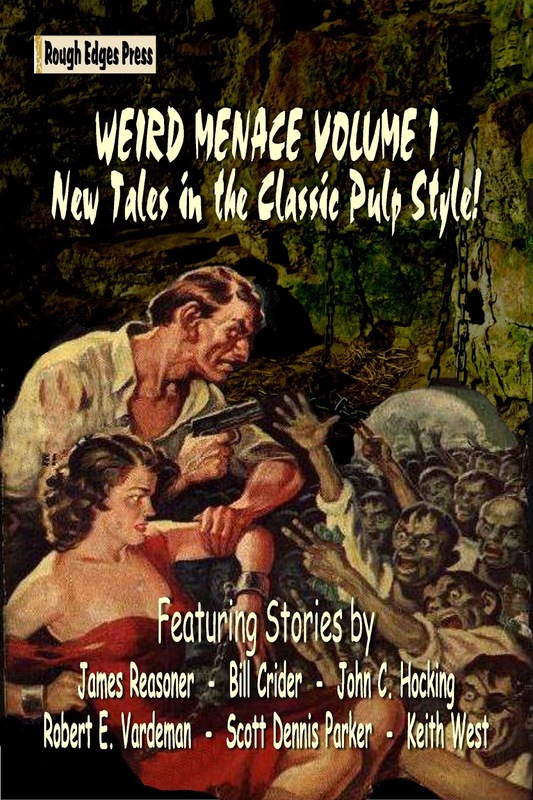 The Shudder Pulps are back! 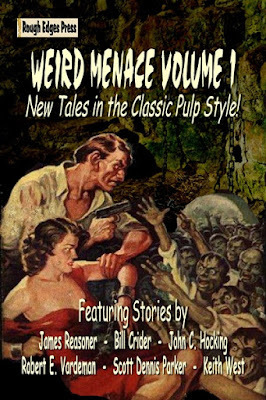 In fact, it's like they never left in this second great collection of new stories inspired by the classic Weird Menace magazines such as DIME MYSTERY and TERROR TALES. Those pulps may have ended in the early 1940s, but some of today's top authors give us the same sort of pulse-pounding, spine-chilling tales they might have published if they had stayed around. World War II casts its looming shadow in Mel Odom's "The Spider-God of Nauru!" Hell comes to a tropical paradise in Keith Chapman's "Lust of the Cave Spirit". American GIs encounter a horror unlike any they ever expected in Michael Bracken's "Attack of the Nazi Snow Warriors". Weird Menace mixes with hardboiled detective thrills in Paul Dellinger's "Ghost Writer". The protagonist of John McCallum Swain's "The Hades Mechanism" confronts a legendary, undying evil. And Ray Lovato's popular character Doc Atlas returns to face a new challenge in "Howl of the Werewolf"! These action-packed stories are sure to entertain. Editor James Reasoner and Rough Edges Press are proud to present WEIRD MENACE VOLUME 2! But when I started watching this one, I felt like I'd seen it before, because it's been copied and parodied so many times. 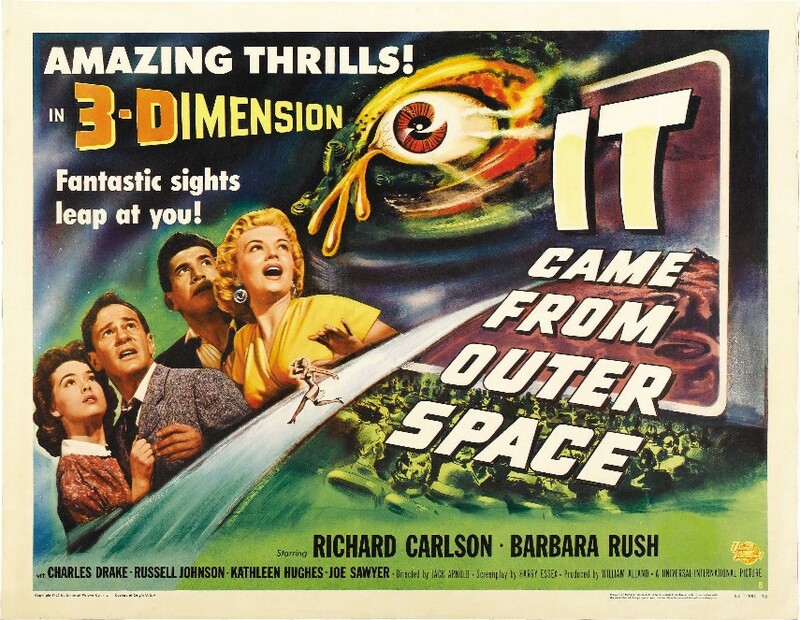 A writer and amateur astronomer (Richard Carlson) lives in a small Arizona town and is out one night with his girlfriend, a local schoolteacher played by the beautiful Barbara Rush, when they see what they think at first is a meteor. But when Carlson examines it more closely, he realizes it's a spaceship. However, a rockslide covers it up before he can prove that to anybody. Then weird things start to happen, accompanied by theremin music, of course, and only gradually do the local citizens start to realize that Carlson was right all along and aliens are creating duplicates of townspeople they've captured. As predictable as it seems now, it probably wasn't so much so in 1953. And familiar or not, the movie is well-made, very effective, and really downright creepy in places. 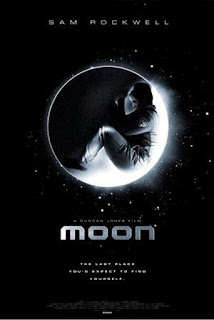 Ray Bradbury came up with the story and according to most accounts wrote nearly all the dialogue, too, although he doesn't get a screenplay credit. Despite the occasional lurid moments, IT CAME FROM OUTER SPACE is rather low-key and intelligent for the most part, with a fine cast that also includes Charles Drake (Dr. Sanderson from HARVEY, one of my favorite films) and Russell Johnson, the Professor from GILLIGAN'S ISLAND, in a duel role as a telephone lineman and an alien impersonating him. I really enjoyed this one and probably appreciated it more now than I would have as a kid. You can expect more of these monster movie posts in the future, since I have a lot of those films to catch up on and others to revisit. 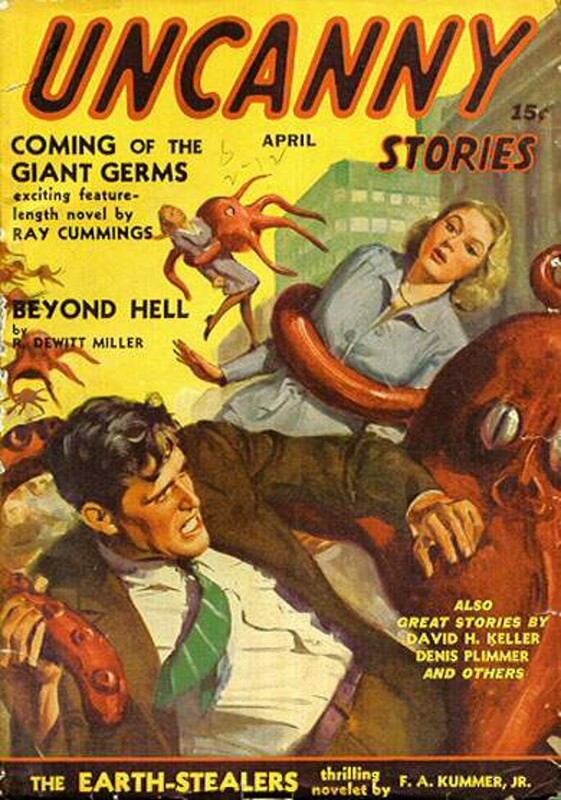 A short-lived pulp I don't know much about, but this issue featured two big names from the early days of science fiction, Ray Cummings and David H. Keller, plus a couple of authors I've heard of, but not read, Frederic Arnold Kummer and R. DeWitt Miller. The name that really jumps out of the TOC at me, though, is Wayne D. Overholser. I had no idea that Overholser ever wrote anything except Westerns. His story in this issue is "Meet My Brother--Mr. Ghost!" I'd be interested in reading it, although I doubt if I ever will. 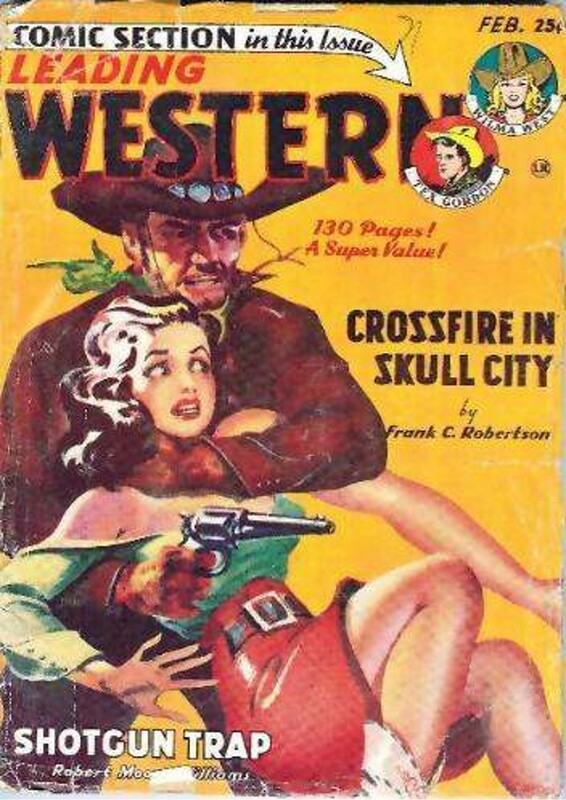 This is a Western pulp that I own and read recently, so I can talk about the stories for a change. That's a cover scan from the actual copy I read, as well. Art by Delos Palmer Jr. Thanks to Bill Crider for sending this one to me. This one leads off with a full-length "novel" (more of a novella, really) by Frederick C. Davis, best known as the creator and author of the novels in the Operator #5 series, as well as the Moon Man yarns from 10 DETECTIVE ACES. It's part of Davis's series about Duke Buckland, which ran for twenty stories in WESTERN TRAILS from 1934 to 1937. Buckland is a wanted outlaw who goes under the name Black Jack Spade, but he's really a good guy despite having the law after him. His young partner is Kit McCane. Buckland's trademark is leaving a jack of spades behind every time he kills a villain or eludes a sheriff, but in "Colt Queen", he and McCane run up against a female bandit calling herself the Queen of Spades who always leaves one of those behind as her calling card. She's really the beautiful but dangerous Dell Clanton, and she has reasons of her own for luring Buckland into a trap. I don't think Davis was quite as comfortable with Westerns as he was with the superspy sagas in OPERATOR #5—this yarn is a little repetitive in both plot and language—but there's plenty of nice action, Buckland and McCane are likable heroes, and Dell Clanton turns out to be a pretty interesting character. This is the only Duke Buckland story I've ever read, but I wouldn't hesitate to dive in to another one if I came across it. "Maverick Law" is the first thing I've read by Francis P. Verzani, not a well-known Western pulp author at all, although he was fairly prolific in the early to mid-Thirties. This novelette combines a couple of familiar plots, the child-raised-by-outlaws story and the save-the-ranch story. It's told in a nice, breezy style and has plenty of action, but it's really predictable, has too much "yuh mangy polecat" dialect, and never rises above the level of just okay. Clyde A. Warden is another writer whose work I haven't encountered until now. When I looked at the first page of "Double-Barreled Decoy", his novella in this issue, I got excited for a minute because under his byline it said "Author of Clan of the Coltmen". This caught my attention because "Coltmen" (or "Coltman") is an oddball word frequently used by one of my favorite Western pulp authors, J. Edward Leithead. I've seen it only one or two other times in stories by other authors. Also, the name Clyde A. Warden reminded me a little of Wilson L. Covert, Leithead's most common pseudonym. So I thought at first I might have uncovered another Leithead pen-name. However, upon reading the story, I'm convinced that it's not by Leithead after all, and the mystery of who Clyde A. Warden really was remains. (Of course, he actually could have been Clyde A. Warden, whose byline appeared frequently in Western pulps for more than twenty years.) 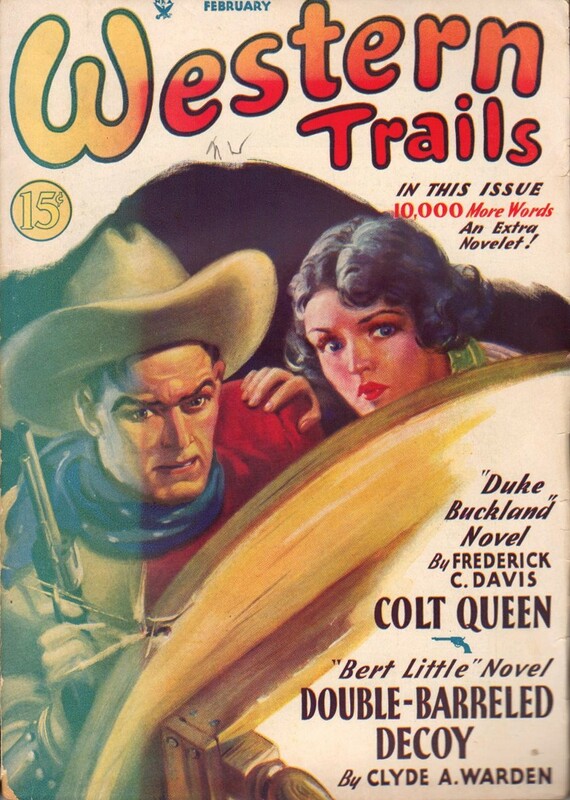 "Double-Barreled Decoy" is part of his long-running Bert Little series, which appeared in WESTERN TRAILS from 1930 to 1938, with at least 69 stories featuring the stalwart hero. Bert Little's background really isn't clear in this one, but it's obvious he's some sort of freelance good guy. At the request of a lawman friend, he takes on the job of bringing outlaw Harry Baxter to justice. That task is complicated by the presence of a beautiful young woman who may be Bert's best friend or his deadliest enemy, he's not sure which. Unlike the Verzani story, "Double-Barreled Decoy" is written in clean, fast-moving prose with good action scenes and some emotional depth. The plot may be fairly standard stuff, but Warden does a fine job with it and left me thoroughly entertained. I'd definitely like to read more of his work. "Branded in Lead" by the ubiquitous (at least in the Western pulps) Larry A. Harris is the story of a man who takes up the owlhoot trail when the girl he loves chooses his half-brother over him. This one has a lot of scope for a short story, covering almost a decade in time, and it's written in Harris's smooth prose, as usual. The ending is a little lacking, but overall I liked it. Not surprisingly since it was written by James P. Olsen, another of my favorites, I thought the novelette "Trigger Tempest" was excellent. It's a cattlemen vs. sheepmen story, an ancient plot but well-handled by Olsen, even though the hero's name, Burnin' Cole, is a bit groan-inducing. Fine action scenes, though. 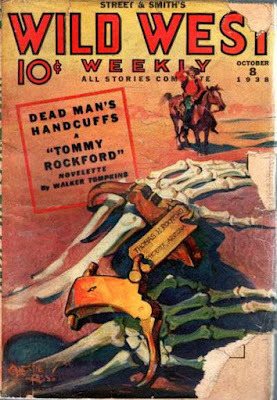 The last story in the issue is "Gun Smith of Tonca" by Joe Archibald, who wrote detective stories, aviation yarns, and sports stories in addition to a lot of Westerns. Since he was a veteran pulpster, you'd expect the prose to be smooth and readable, and it is. The plot, about the aftermath of a stagecoach robbery, is fairly complex for a short story, with a couple of nice twists. This is another entertaining tale. All in all, this is a fine issue of WESTERN TRAILS, never one of the top pulps but a consistently good one. The stories range from fair to excellent, and I really enjoyed reading it. UPDATE: Will Murray advises me that Clyde A. Warden was that author's real name. Thanks, Will! I need to find more of Warden's stories. 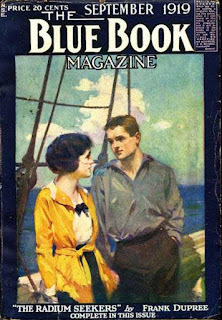 THE HORN HUNTERS is a novella that originally appeared in the September 1919 issue of BLUE BOOK. Set in the jungles of Southeast Asia, it's about an American big-game hunter known as Say-and-See Smith, who is after some legendary and highly valuable golden rhinoceros horns (real horns that have a golden color, not horns made out of gold). He teams up with a two-fisted scientist, makes an enemy of a Chinese opium smuggler, rescues a beautiful girl from a deadly torture trap involving a cobra, finds a lost city, and generally swashbuckles his way through this very pulpish tale. I've written many times about my fondness for the work of H. Bedford-Jones, so it's no surprise that I enjoyed THE HORN HUNTERS. An ending that probably could have been a little more dramatic keeps this one from being in the top-rank of his stories, but it's still thoroughly enjoyable. As always, Bedford-Jones's prose is lean, fast-paced, and very effective, and Say-and-See Smith is a cool-headed, hardboiled protagonist. There are some nice scenes of spectacle that would have worked well in a big, A-list 1930s movie with hundreds of extras and, say, Randolph Scott as Smith. THE HORN HUNTERS is available as an e-book from Wildside Press. The story shows its age a little (it is 96 years old, after all), but I found it quite enjoyable, and if you're a fan of pulp adventure in general and H. Bedford-Jones' work in particular, it's well worth reading. 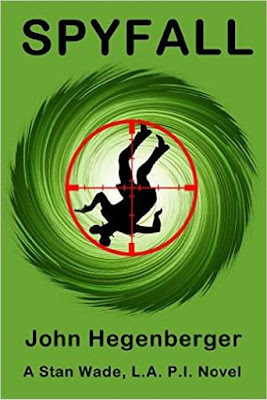 I had nothing to do with publishing John Hegenberger's novel SPYFALL, which comes out in a couple of days, so I can rave about how good it is without seeming too self-serving. As I've said before, I love a book that has a distinctive voice, and SPYFALL certainly does. Stan Wade is a private detective in a vividly realized Los Angeles in 1959, primarily taking cases that involve the movie community (as Dan Turner, Bill Lennox, and many other fictional private eyes did before him), but he's also something of an unofficial secret agent, handing sensitive assignments involving politics and espionage that come his way from one of his regular clients, Walt Disney. Yeah, that's right, Uncle Walt his own self is actually a secret spymaster on the side of the good guys. And that's just the start of a caper (there's really no other good word to describe this novel) involving Ian Fleming, Mickey Cohen, and countless other cameo appearances by historical figures from the era. The action moves swiftly from L.A. to Jamaica to Berlin to Paris, with a shadowy Russian assassin trying to kill Stan every step of the way. With all of this going on, Stan still manages to influence history in ways we never would have guessed. 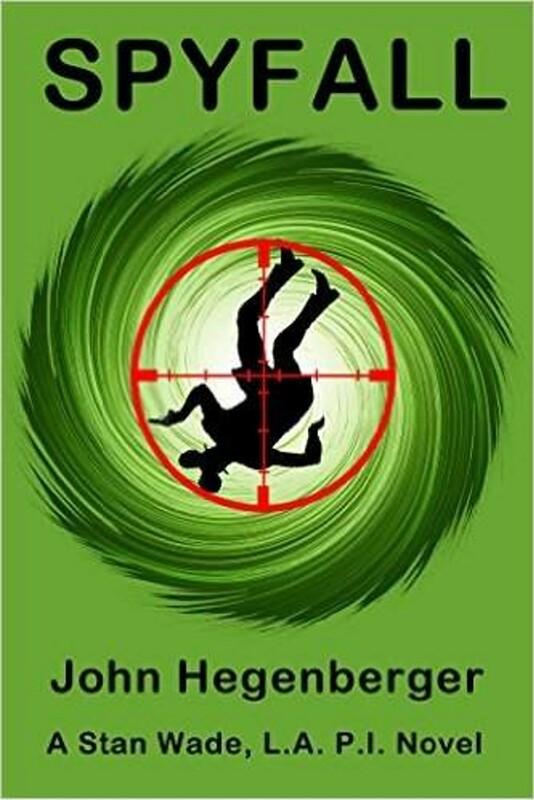 SPYFALL is just pure fun, packed with humor, plot twists, and occasional dark undertones. Stan Wade is a very likable narrator/protagonist, and his friend and aspiring private eye Norman is a fine sidekick. There are more pop culture references than you can keep up with, which can sometimes get tiresome very quickly, but Hegenberger keeps them fresh and realistic and never annoying. SPYFALL is one of the best books I've read this year, and luckily there are several more Stan Wade adventures in the works. I'm looking forward to them. The Weird Menace pulps flourished for less than a decade, from the mid-1930s to the early '40s, but while they were popular, they delivered adventure, excitement, and spine-tingling thrills in quantities rarely seen before or since. Mad scientists, deranged henchmen, damsels in distress, and stalwart heroes raced through their pages in breathless, over-the-top, never-ending action. A good Weird Menace yarn really is just one damned thing after another. But keep an eye out behind you. You never know when something might be sneaking up on you. 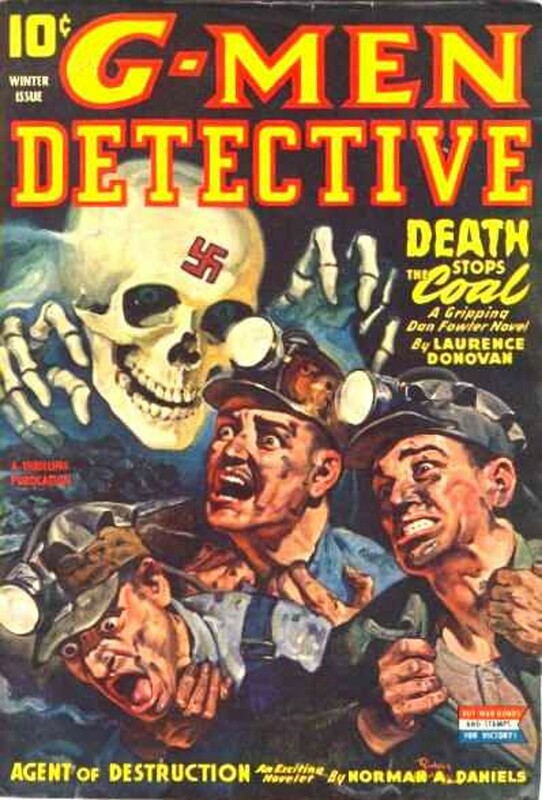 That's a pretty grim but effective cover on this issue of G-MEN DETECTIVE. I've read quite a few of the Dan Fowler novels and found them to be consistently entertaining, despite the wide variety of authors who wrote them. This one is by Laurence Donovan, and there are also stories in this issue by the prolific Norman A. Daniels and Robert Sidney Bowen. Since H. Bedford-Jones died in 1949, the full-length novel "Guns at Hell's Border" was either an unacknowledged reprint or a story that had been lying around in inventory at Popular Publications for a while. Either way, I'd sure like to read it, as Bedford-Jones is a long-time favorite of mine. I don't have this issue, though. Maybe someday. The only other story in the issue is a reprint of a T.C. McClary yarn originally published in 10 STORY WESTERN half a dozen years earlier. Nice cover on this issue of ALL-STORY WESTERN, too. Thanks to Brian Ritt for the heads-up on this! Orrie's now a video star. Can you imagine what he would have thought all those years, sitting in his kitchen banging away at his typewriter, if you told him his work was going to make such a comeback? I suspect he would have been happy about it. 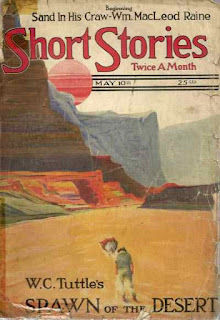 W.C. Tuttle's novel SPAWN OF THE DESERT was published in the May 10, 1922 issue of SHORT STORIES, then reprinted by Doubleday, Page the next year in that oddball series of digest-sized paperbacks comprised of material from SHORT STORIES, complete with the usual "Red Sun" covers. 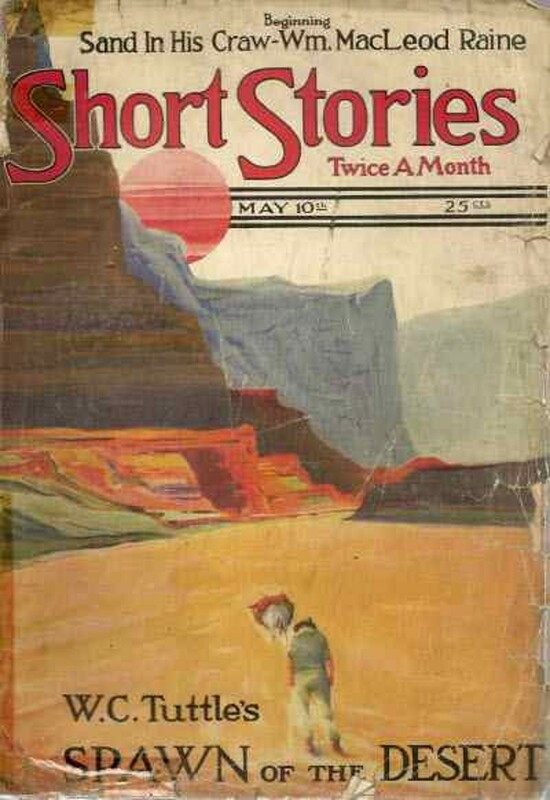 It's a stand-alone novel, instead of an entry in one of Tuttle's many series, and opens with a pair of mysterious travelers arriving in the rough-and-tumble mining town of Calico, on the edge of the Ruby Hills. Calico is ruled by a brute of a man known as Silver Sleed, and it doesn't take long for the newcomers to clash with him. The pair are Duke Steele, who gives every appearance of being a gunman, and a white-bearded old timer who claims his name is Le Saint. The Saint, as he comes to be known, is part preacher, part gambler, part killer, and a man haunted by secrets. When Steele and The Saint meet Silver Sleed's beautiful daughter Luck, it's inevitable that those secrets will begin to come out and result in gunplay and tragedy. 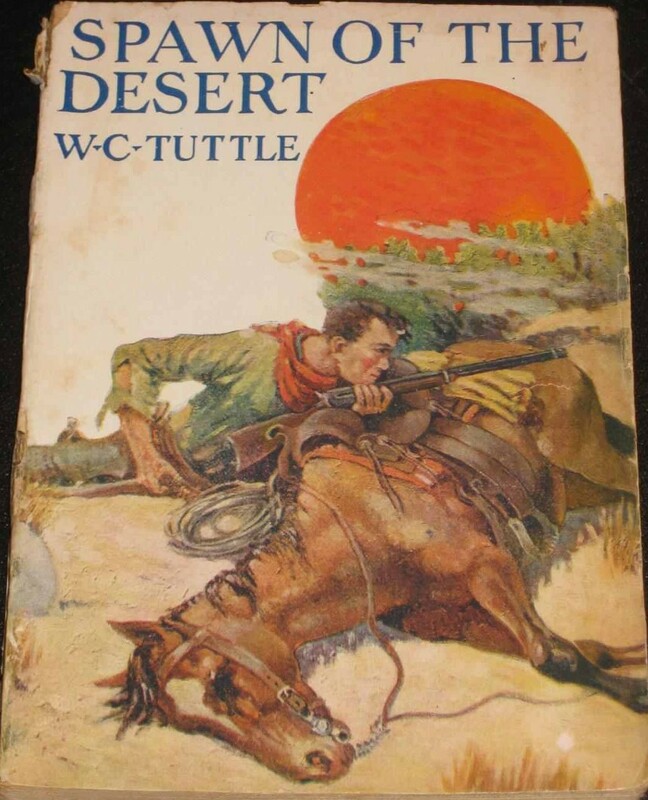 I love W.C. Tuttle's work for its irresistible blend of mystery, comedy, and Western action, but SPAWN OF THE DESERT is a very different book for him. There are a few small touches of humor, but mostly this is a grim yarn full of psychological drama, much more reminiscent of Max Brand than of Tuttle's usual output. However, it's written with Tuttle's usual talent and he really makes the characters and setting come to life. The long, compelling scene that forms the climax is as suspenseful as anything I've read in a good while. You're not likely to run across either of the original editions of this book, but there's a very badly scanned e-book version available on Amazon. That's how I read it. The poor production values are annoying at first, but the story is so gripping that I soon forgot about those problems. 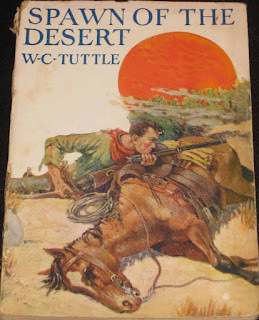 If you've never read Tuttle before, this probably wouldn't be a good place to start, but if you're already a fan and want to see him trying something different, I highly recommend SPAWN OF THE DESERT. UPDATE: And thanks to August West, we now know there was a movie version as well! Judging by the IMDB entry, it appears to have been a fairly faithful adaptation, too. 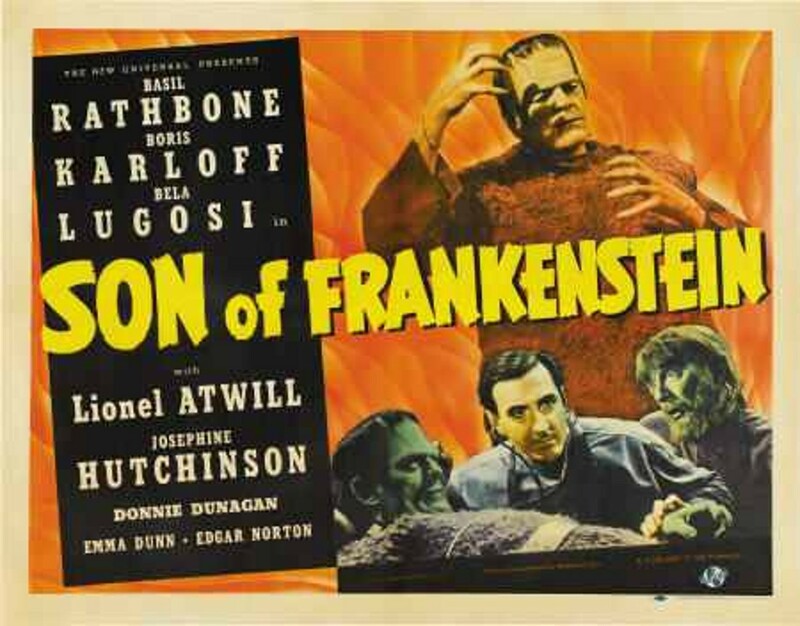 I recently watched SON OF FRANKENSTEIN, the third and final film to feature Boris Karloff as the Monster, for the first time in years, and I was pleased to discover that it holds up really well. Although it's generally regarded as the least of the opening trilogy in the series, it's actually my favorite of the Frankenstein movies for several reasons, most of them involving the cast. Karloff is bigger and bulkier than ever as the Monster, and he's great as usual. But Basil Rathbone gives a fine performance as Wolf von Frankenstein, Victor's son, who winds up reviving the Monster even though he knows he shouldn't. My favorite actor here, though, is Bela Lugosi, who is almost unrecognizable as Igor and turns in one of his least hammy performances. He summons up some serious creepiness in this movie, especially when he peers through windows or hidden openings in the walls, as he often does. The script is good, too, with some nice touches of humor. At one point Rathbone, as Wolf von Frankenstein, complains that people think the Monster's name is Frankenstein. (I did when I was a kid, and you probably did, too.) I always enjoy seeing those stark Castle Frankenstein sets, and the photography is nice throughout. Rowland V. Lee, the director, wasn't as much of a stylist as James Whale, who helmed the first two films, but he keeps things moving along briskly and the action-packed ending is both exciting and poignant. Overall, I find SON OF FRANKENSTEIN to be a huge amount of fun. For the past forty years, Stephen Mertz has been a bestselling author of thrillers and men's adventure novels, while also becoming known as one of the best mystery writers in the business. 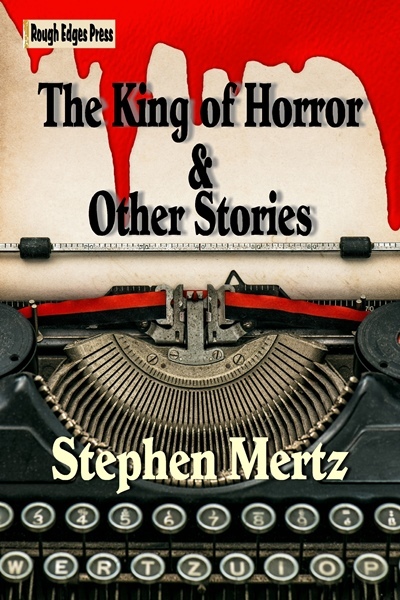 THE KING OF HORROR & OTHER STORIES, the complete collection of his short fiction, showcases the wide variety of his work, from Westerns and historicals to hardboiled private eye yarns to pure pulp adventure and razor-sharp suspense. 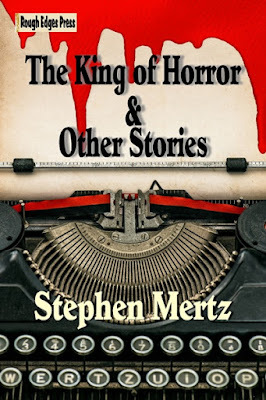 Rough Edges Press is proud to present THE KING OF HORROR & OTHER STORIES. Featuring an adventure of the Federal Gorilla Bureau! 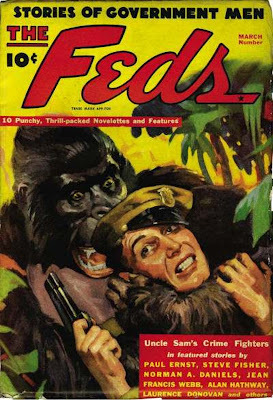 Seriously, this cover seems to be illustrating a story by Alan Hathway called "The Gorilla Speaks", but I have no idea what it's about. Other authors in this issue are Steve Fisher, Paul Ernst, Laurence Donovan, Norman A. Daniels, Ben Conlon, George Allan Moffatt, Jean Francis Webb, and William G. Bogart. If you're keeping score, that's four guys who wrote Doc Savage novels (Hathway, Donovan, Daniels, and Bogart) and another who wrote under the Kenneth Robeson by-line (Ernst, on THE AVENGER), plus the fellow who wrote Pete Rice (Conlon) and one of the many Phantom Detective authors (Webb). Quite a line-up. That cover sort of says it all, doesn't it? And this is only the first volume. Volume 2 will also be out later this month. Plus I'll write an intro for the book. LEADING WESTERN was one of the Trojan Publications pulps (as if you couldn't tell that from the cover). Another bottom-rung market, according to conventional wisdom, it featured stories by some decent authors despite that, including in this issue Frank C. Robertson, who had been around forever by 1950 (I love that title, "Crossfire in Skull City"), Robert Moore Williams, and Gardner Fox. I'm sure they were pretty entertaining yarns, too. 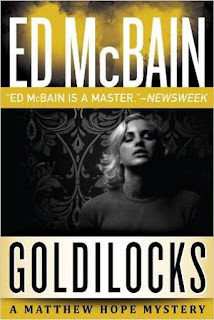 I wanted to read something I hadn't read before for Ed McBain Day, and since I never got around to reading the Matthew Hope series, I figured the first one would be a good place to start. The results were...well, mixed. Matthew Hope is a lawyer in Florida--not a criminal lawyer, as he's quick to point out in several occasions--but he finds himself mixed up in a murder case anyway when a doctor friend of his walks into his house one night to find his wife and young daughters savagely stabbed to death. This is the doctor's second family--he has an ex-wife and two grown children, plus some other entanglements, as Matt quickly discovers. The grown son from the first marriage confesses to the killings, but something about his story doesn't seem right to Matt, who continues digging. McBain (who we all know was really Evan Hunter, right?) does a fine job with the Florida setting. Not as good as John D. McDonald, but then who was? The writing is smooth and the pages go by quickly, as I'd expect from McBain. The dialogue is good and there are several of those fast-paced question-and-answer scenes that he employed to such good effect in the 87th Precinct series. There are a couple of problems in GOLDILOCKS, and they're sort of connected. The mystery is fairly weak, and Matthew Hope isn't a very good detective. In fact, he's not really a very likable protagonist, and most of the other characters are unpleasant, too. There are plenty of people in this novel to feel sorry for but not many to root for. There's also a moment that seems so wrong and unnecessary that I felt the uncommon urge to throw the book against the wall. But I was reading it on my Kindle, so I restrained the impulse. 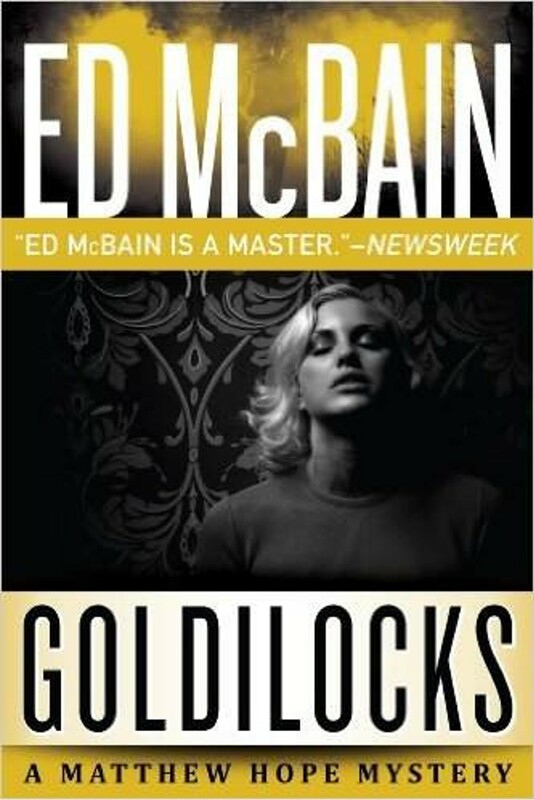 All that said, there was enough I did like about GOLDILOCKS that I'm tempted to try at least one more book in the series. I don't expect that to happen any time soon, though. 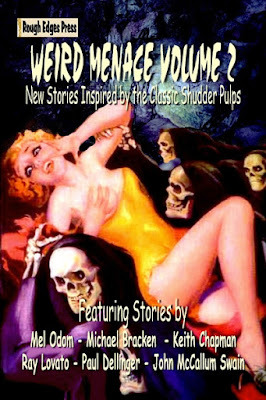 The complete collection of Stephen Mertz's short fiction. Introduction by Evan Lewis.